Home Food Can Fruit Save Our Food Waste Problem? T he oranges you see peeking out above garden fences and intersections in the San Fernando and San Gabriel valleys that flank Los Angeles are mementos of a time when the area was full of orchards. These orchards, already ranging in long straight lines by 1920, endured the days of oil fields being drilled and film studios being built, only to succumb to the postwar housing boom. Fueled by the aerospace industry—much of it headquartered in the area—home construction exploded, and the orchards made way for subdivisions of identical houses with enclosed yards, each one shaded by a single spared tree. In certain parts of the San Fernando Valley—that vast swath of land stretching from the poolsides of Encino to the chaparral-studded hills of Pacoima—the trees seem to be waving to one another, their loads of fruit like bright flares in the Valley’s flat white light. It’s Food Forward’s mission to not let such fruit go to waste. 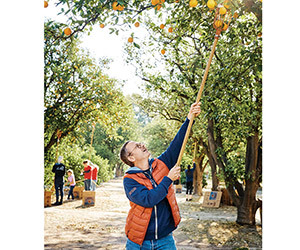 The group’s founder, Rick Nahmias, calls the San Fernando Valley “a decommissioned citrus orchard,” and since he started the group in 2009 with a simple backyard pick, it has grown into an energized urban food-gleaning organization. Food Forward runs a switchboard of sorts, where donors’ trees are picked by a team of volunteers (who transport the fruit to food pantries immediately). It also mobilizes teams at 18 weekly farmers’ markets, consolidating all produce that farmers don’t want to take back with them. The 12-week Can It! Academy that Food Forward periodically offers provides in-depth training to a constituency of food preservers who have diverse interests, from preserving the bounty of their kids’ edible schoolyards to starting a home-based jam or pickling business. Instead of celebrating, he and Steve drove home in stunned silence. “How do you get your mind around the fact that 53 percent of the population believe you don’t deserve a basic right?” he remembers thinking. By then the country was also ensnared in the sharpest economic downturn since the Great Depression. The San Fernando Valley, where he and Steve live, was hit particularly hard, especially its northeastern rim, by housing foreclosures. For Sale signs creaked in the wind that blows down through the mountain passes and runs along the cinder-block garden walls. With the help of the community-organizing group One LA, activists like Father John Lasseigne of Mary Immaculate Church in Pacoima helped hundreds of congregants to negotiate as one with the banks. For many others it was too late—the shrinking economy had become about hunger. “There were people lined up outside food banks two miles from my house that I didn’t even know were there,” Rick says. It was in that frame of mind that one day he took his dog, a rescue mutt named Scout, for a walk. At 12 years old, Scout walked slowly, and as Rick’s mind wandered, he noticed the fruit-laden tangerine and navel trees in the garden of his neighbor Heather. A 50-year-old photographer, Rick is a son of the Valley. Growing up in Tarzana in the ’70s, he and his friends would gather in the golf courses that abutted several developments, using the greens and sand traps as their playgrounds. It was a childhood spent, as he puts it, “in the bubble of carpools and suburban sprawl.” Riding in the backward-facing seats of the family’s wood-paneled Ford Country Squire station wagon, he’d seen many, many orange trees go by. And he knew what happened. A good faith effort was made to pick some, then everyone got tired of eating them, and the living-off-the-land lark was allowed to run its course. The fruit either rotted on the branch or eventually dropped onto the lawn and decomposed. Here was food, he thought. Two miles away, people were lining up for food donations. Had he lost such agency in his life that he would just let the progression of things play out the way they always had? Rick was tempted—sorely tempted—to do nothing. Marriage could be snatched from people, why fight anything? But Scout’s pace kept him there, walking slowly along the garden’s edge, thinking. Would it take so much effort to pick that fruit and donate it? By the time he got home, he had called Heather, the neighbor on whose property the trees stood. As fellow dog owners, they’d grown friendly. She told him to go ahead; she’d already picked all she could possibly use. Not quite sure how to proceed after his grand statement, he put an ad on Craigslist, announcing the pick that weekend. A young woman who saw the ad showed up on Saturday morning. She was experienced enough as an urban forager that she’d thought to bring banana boxes and empty berry flats retrieved from behind a supermarket to put the fruit in. It took three weekends to pick the trees clean. By then the director of SOVA, the Jewish Family Service of Los Angeles’s food program at the corner of Vanowen and Hayvenhurst, had grown so used to seeing Rick and his helpers unload boxes from the back of Rick’s VW Jetta that he told him if he was interested in picking more, he had just the orchard for him. The Valley has its own form of culture. A squat run-down building in Van Nuys might turn out to be the recording studio from where Nirvana’s grunge anthem “Smells Like Teen Spirit” went out into the world. Along with news of homecoming night and exam schedules, the towering sign outside North Hollywood High proudly proclaims it’s the alma mater of Susan Sontag and Cuba Gooding Jr. Rick is embracing his local roots when he describes the location of the SOVA-recommended orchard in Valley terms. “It’s where Winnetka intersects Devonshire,” he says, “near what used to be Lucy and Desi’s country estate.” Back he went to Craigslist, also putting up flyers on the surrounding Starbucks community boards announcing a pick and a potluck. By the end of that March day, the team had filled 200 boxes with Valencia oranges. Even more surprising for Rick, 12 of the people who’d climbed the ladders, plucked—twisted, really, so as not to tear the peels—and hauled box after box had taken the time before departing to leave him their phone numbers and e-mail addresses and asked to be contacted if he ever did this again. Rick continued with this small model of food activism, but what he ended up with was something much bigger. The County of Los Angeles Agricultural Commissioner estimates there are 660,000 fruit-bearing trees in the county. Plenty of trees to pick. In a way he had found not only what would become Food Forward’s mission but also the method by which it would work. The operation is nothing if not efficient. The group is responsible for intelligence gathering on possible harvesting spots and for supplying equipment and the stacks of flattened boxes imprinted with the logo. The people who sign up for a pick supply the sweat. What they receive in exchange is the kind of jolt of positive energy that is the coin with which volunteering is paid. To even dip into the volunteering opportunities the organization offers is to feel that energy oneself. When I signed up to do a pick on a weekday in Lake Balboa, one of many suburban neighborhoods in the Valley, I was sent a confirmation e-mail with the time, address, and how long I should expect to stay. On the day of the pick, as I drove down the street, I saw a Food Forward sign had already been affixed to the lawn of the ranch house—like a campaign tactic by an orange-faced candidate—to guide volunteers and inform passersby. A young woman was our pick leader; a woman in her sixties who’d taken early retirement completed our trio. Within minutes we were easing ourselves through the gate that the homeowner had left unlocked and entering the yard. It was peculiar. For a moment I felt like an intruder. A dog’s chew toy and a child’s tricycle lay in the grass. Someone smoked, though the ashtray was kept outside. Soon I had a picker’s bag strapped to my shoulder, a pole with a clawlike end in my hand, and had internalized what might as well be the group’s motto: Twist, don’t pull. I was amazed at how seriously I was taking this, struggling to get those oranges that reached across the fence and over the neighbor’s pool. A few minutes before the two hours were up, we’d raked clean the area under the tree (“Always good to leave it better than you found it,” our pick leader said), we’d loaded the pickup, and I saw 150 pounds of oranges heading to a food pantry. T he market-gleaning teams that Food Forward inaugurated in 2012 have since extended their activities into a realm of food more public than the backyard. Since 1981, the Santa Monica Farmers’ Market has taken place every Wednesday morning on several cordoned-off streets a few blocks from the Pacific. It’s a great gathering of dusty pickups, chefs with trolleys, and shoppers looking for a quality of fruit and vegetable no supermarket can provide. There’s always time to pause and chat with acquaintances, but in the early hours every shopper is focused on something important, like getting to the rancher who brings loganberries for about two weeks a year before his trees are done. “Giving Good Weight,” John McPhee’s 1978 New Yorker piece on the experience of working in the stalls at the Harlem, Brooklyn, and Midtown East markets, brings the physical aspects of urban provisioning to life. “You people come into the market,” he writes about his time in the stalls, “and you slit the tomatoes with your fingernails. With your thumbs, you excavate the cheese. You choose the string beans one at a time.” The level of mistrust may have lessened (and the organic status inquiries may have shot up), but neither the forceful melon thumping that goes on in Santa Monica nor the prudent pressing of the pluots (to say nothing of the outright grumbling about the price of the Blue Lakes) can dampen the satisfied murmurs of city dwellers before great produce. That first pick was an example of Food Forward’s ability to invent a mechanism practically on the spot. Sarah Spitz was there the first month of the gleanings. “We knew nothing,” she recalls. “How are you going to track donations, weigh food? What are the organizations you’re going to give it to? One thing we figured out quickly is, Don’t ask for donations until almost the end. Don’t interrupt the farmers while they’re trying to sell.” Today those principles are applied in the 18 local markets where Food Forward gleans. The one in Torrance, in L.A.’s South Bay, where my daughter, Isabel, and I volunteer one weekday morning, is run with Food Forward’s signature efficiency. The e-mail told us to meet behind the kettle corn stand at the market’s edge. Two volunteers in sun visors sign us in and give us a basket of name tags of previous volunteers to sift through (to save paper). Meanwhile Tom, an older man who participates every week, gets the weighing scale and trolley he keeps by arrangement with the custodian of the nearby rec room. The names Isabel and I go through represent a nice cross section of L.A. (Rowena, Hyung Joo, Armando, Agnes, Brittany, Zoe), but not finding our own, we write out identifying tags. We move among the stalls, choosing our moments to politely ask farmers whether they’ll be donating this week. “Yeah, give me three boxes,” a man with a table heaped with cucumbers says. We assemble the boxes and write the name of his farm on the sides. We’ll be back in half an hour to pick them up. “Don’t ask that one,” Tom says, not intimating that the person is mean, just that they’re not into donating their stuff. Cool. Unlike the Hollywood or Santa Monica markets, where a chef might be trundling through with his hand truck, Torrance’s market is about good staples for locals. A line has formed in front of the stand selling hormone-free eggs. People bring their own empty cartons. The two guys selling musubi, that Hawaiian energy bomb of Spam in sticky rice wrapped in nori, have just sold out. A half hour later, as the tables begin to be folded up, we walk back around, gathering the now-full cardboard boxes and ferrying them back to our post, where we weigh them, make note of who donated, and divide the produce among community groups, some of whom have already shown up. The driver from a retirement home stacks boxes of speckled greens into his pickup. He also gets a lot of thyme and basil and some thick, ruddy carrots, just the way I like them. For a moment I’m tempted to pocket a few, except I figure that’s being a very bad volunteer. Instead I help a young woman cram boxes of eggplant and fresh stone fruit into the back of her Nissan. She’s come from El Nido, an organization for families dealing with poverty and violence that’s housed in a two-story stucco building on Manchester Avenue in South L.A. I know the building; its little Astroturf playground is a splash of vivid color under the jets coming in to land at LAX. I’m glad I’m loading boxes of peaches and cucumbers into the trunk of her car. In that landscape with few trees, little shade, and much heat-trapping concrete, these peaches and cucumbers seem vital and alive. It isn’t until she’s driven off and I realize I’ve helped the group get boxes of great produce that I feel the full Food Forward rush. “A lot of our new volunteers get what we call ‘fruit goggles,’ ” Rick says as he gives me a tour of Food Forward’s North Hollywood headquarters. “Once they get the idea of saving fruit, they see it everywhere.” I nod because I know what he’s talking about. Somewhere in the glove box of my car is an index card with the scrawled names of two intersections where I’ve seen loaded branches overhanging the sidewalk. Food Forward’s headquarters is located in a squat industrial building where people are busily working on laptops and desktop computers. The company logo, modeled on an old citrus box, adorns the reclaimed-wood walls. The key piece of equipment—the clawlike metal picker you can shoot up a pole into a thicket of leaves to grab fruit beyond even the highest ladder—serves as a sconce over bare bulbs. There are crops other than oranges in the Valley, and as soon as Food Forward volunteers began to pick Meyer lemons, they had a problem. The Chinese sweet citrus has a soft skin, which makes it impossible to donate to food pantries because it rots easily. Perhaps they could learn to make jams and sell jars for fund-raising? Rick had recently met Ernest Miller, a well-regarded local chef, and they agreed that Food Forward would sponsor a 12-week course that would lead to food preserver certification. In 2011, Miller had helped revive the University of California Cooperative Extension’s decades-old commitment to teach safe home-canning techniques. That instruction had thrived during the Depression and the victory-gardens era of World War II; it had all but ceased operating by the 1990s. When I catch up with Miller, he is conducting one of the seminars on the top floor of Santa Monica Place, the remodeled mall by the 3rd Street Promenade. Professorial, though quick to laugh, he stands in a white chef’s coat before 18 students. Some of them come from the thriving edible schoolyard movement, in which students plant and maintain gardens. Two young women want to start their own business, taking advantage of California’s recently passed cottage food law, which allows certain foods—particularly jams—to be sold when made in a home kitchen. B y early 2014, only two years after its first farmers’ market effort, Food Forward had developed a reputation for its efficiency. “We were getting random calls from people who found our name on the Internet and wanted us to pick up six pallets of squash in the downtown market,” says Rick. “So we became an ad hoc recovery service. We purposely didn’t have refrigeration because we didn’t want to hold anything. We’re the transfer point between donors and receiving agencies.” With more and more calls coming in about entire pallets, he understood he had to begin foraging at the downtown market, a vast spread that stretches along Olympic Boulevard between Central Avenue and Alameda Street. Rick wasn’t quite sure how to engage with the mini city. The answer came in the form of Luis Yepiz, a six-foot-three pony-tailed musician who had switched from punk to opera. Luis had started driving a truck to the market early in 2014. I meet Luis at 4:30 a.m. one day to accompany him on his market run. He’s already driven from his home in La Puente to pick up the truck at the MEND food bank in Pacoima. Exceeding L.A. County averages, this region ranks high on a poverty scale that reflects a host of health challenges. A map published in a study conducted by UCLA health researchers indicated, in shades of blue, the likelihood of amputation due to diabetes; the northeastern Valley is represented by the deepest blue, as is South Los Angeles. While diet can’t be solely responsible, lack of fresh produce in markets is what Dylan Roby, coauthor of the study, calls “a social determinant of health.” Compounded by other factors, health care becomes “a matter of tertiary intervention. You deal with disease when it’s a crisis.” When Food Forward became involved in recovery from the downtown market, it entered a new phase, perhaps one that had been awaiting it, operating within the inescapable dual narratives of modern American life: waste and hunger. Rick had prepared me for Luis’s big personality. 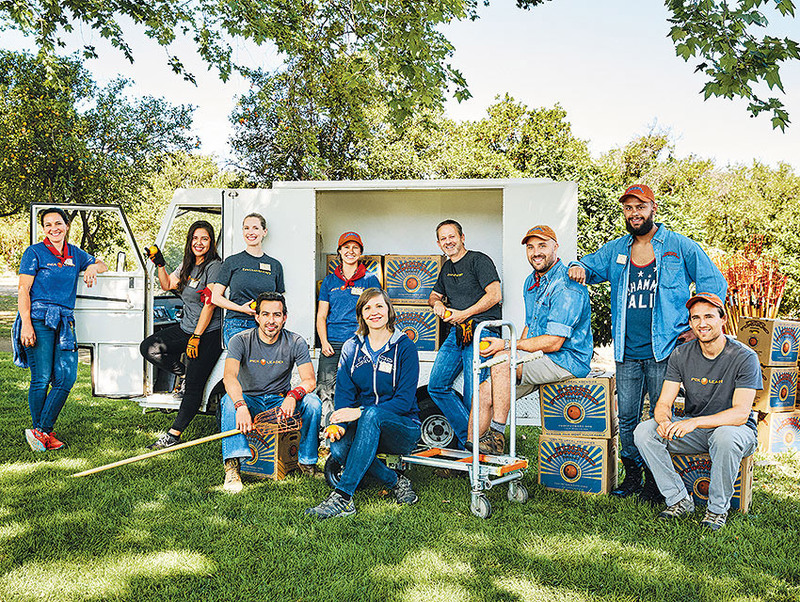 “He can look a guy in the eye who has just donated 20,000 pounds of produce and say, ‘I can’t take that,’ about a pallet he doesn’t like.” Luis’s technique is to get noticed—and not be shy about asking. No sooner had we parked than he was scurrying up loading docks, charging through industrial-weight flyflaps with a “Que pasó, raza? ” to the workers who might be taking a predawn break. He’s been doing this long enough—six months now—that he knows whom to bother talking to, who communicates with just a nod. It’s a world where he has to encourage generous impulses yet also watch out for brokers who would love to get rid of rotten produce and save themselves the $45 a ton they’d have to pay to have it buried as waste. There is a lot of that. I separate myself from Luis as he’s negotiating in the depths of a refrigerated warehouse and see a young man emptying crate after crate of melons into a Dumpster while carefully folding the cardboard boxes the produce came in. The packaging retains some value. By eight in the morning, sunlight has broken and the noise of traffic from the rest of the city has reached the speed the wholesale market has been operating at all night. There’s one last stop—a particularly good donor—and we’re standing on the dock when a warehouse man wheels out a forklift with a pallet stacked high with peaches. He knows better than to drive it onto Luis’s truck. Luis reaches up, plucks one peach from the top, takes a bite, and nods. Still the driver knows not to drive onto the truck. Luis reaches into the bottom third and takes another peach. Again he bites, chews, nods. “You have to be prepared to eat a lot of crap at this job,” he says. He doesn’t need to nod for the forklift to push the pallet into the last empty spot on the 24-foot-long vehicle. Before noon, Luis has driven to Heart of Compassion, a large volunteer-run distribution center in Montebello. Guys with shaved heads unload some of the pallets, and we serve ourselves a quick early lunch of salad (from a reclaimed box) and stew (made with salvaged bell peppers), from trays laid out on a trestle table. Then we head across town to the Dream Center, a transitional-housing facility located in the former Queen of Angels Hospital off Alvarado Street in Echo Park. Built in 1926, it’s an elegant 15-story brick structure in the Spanish revival style. A group of experienced residents swings into action when we arrive, transferring the pallets from the truck into refrigerated containers running on generators in the parking lot. Later they will move some to their own kitchens and subdivide much of the food into individual bags, which they’ll donate to people who line up outside each morning. In a few hours I’ve learned to dodge forklifts, but I know that I’ll only be in the way if I try to help move things on the truck. I walk around to the front of the building, where I stand looking down at the 101 freeway. Traffic pools in the direction of downtown. In the distance a helicopter chops through the pale haze. This is a different city from the one I inhabit. Restaurants are my beat. In that world, seating is an index of power. The other night I heard a maître d’ say over the phone, “Of course you can have the VIP table—it’s Monday.” And I don’t think he realized how he’d just cut the guy down. This full truck measures something else. L.A. is a city where eating food is public. There’s the wood rail that runs around the parking lot at Tommy’s Burgers on Rampart, where people perch to eat chili fries. Dusk settles over groups ordering from the taco stands that pop up beneath strung-up lightbulbs near MacArthur Park. A weighed-down pickup might be full of watermelons or mounds of ripe plantains, ready to be bought and taken home and fried. On Vermont Avenue I often see women selling flor de loroco, a white flower that’s stuffed inside the masa of Salvadoran pupusas, lending a sharp bite to the cheese filling. All those white flowers seem abundant—lush—but they’re just another mask over the face of hunger in the city, a realization that hits me now, vague and inchoate, as an unseen pang. “That’s it!” shouts Luis with typical pep when I rejoin him. He rolls down the back door of the truck, and we hop into the cab. We’re in Pacoima at one in the afternoon. By the time the food bank staff here has unloaded the truck’s last pallets, we’ve distributed 15,000 pounds of food. Luis will start again tomorrow at 4 a.m.
H ow does this translate to the private sphere? Being even slightly involved with Food Forward has had a real effect on the way I eat. There’s the practical matter of finishing everything on my plate that comes into conflict with my role as a critic, which often involves ordering an extra dish or two. When I cook, I cut off the carrot top as precisely as possible, wash rather than peel the cucumber. I make sure to eat the cheeks and the belly meat on the branzino. 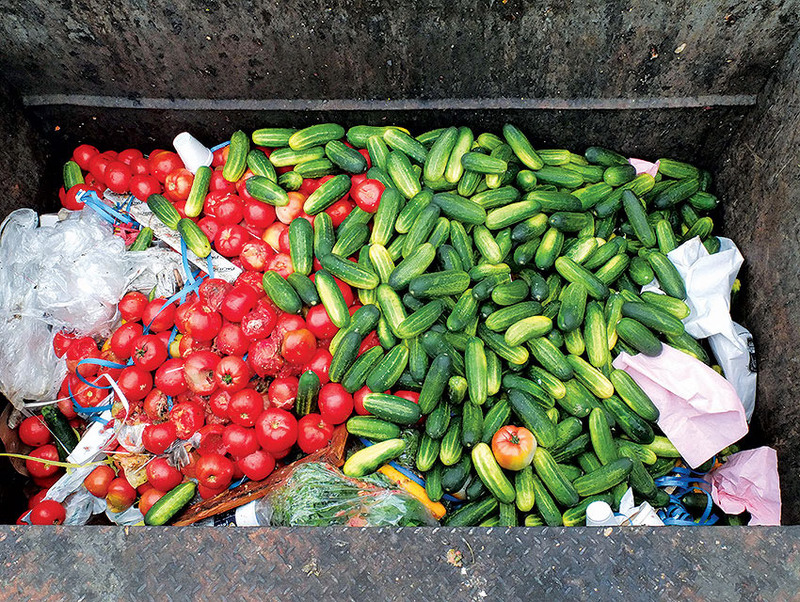 It’s not flavor but more an awareness of waste that links us to an older understanding of food. Canning, pickling, jam making—these techniques speak to a sense of self-reliance that is very different from being a docile consumer. I wouldn’t call it “ethical eating.” (When I was a too-serious 16-year-old using a wood spoon to eat brown rice from a bowl I’d carved, I would have merited that description.) And it’s not exactly a flavor that’s gained, but by being aware of waste and seeking to avoid it, we find a link—perhaps stronger than any recipe—to the generations that put up, that stretched out a ham through the winter, that made sure every last piebald bean went into the basket. American cooking seems most resonant when it’s reusing the Thanksgiving turkey bones to make the next day’s soup. With its logistical resources, Food Forward can now take on any size orchard, even the few remaining large ones that somehow escaped being uprooted. The volunteers will go through the grove at E. Waldo Ward & Son, a small company that, for more than a century, has been making jams just south of the canyons that reach into the San Gabriel Mountains in Sierra Madre. The orchard that skirts the entry drive of the Huntington Library and Botanical Gardens in San Marino was protected by the institution. The 400 trees at the southeast corner of Cal State Northridge were protected by Robert Gohstand, a professor of geography who, in the early ’80s, heard that the grove the college had been built around was going to be dug up. Gohstand led this effort with the widespread support of the campus community. 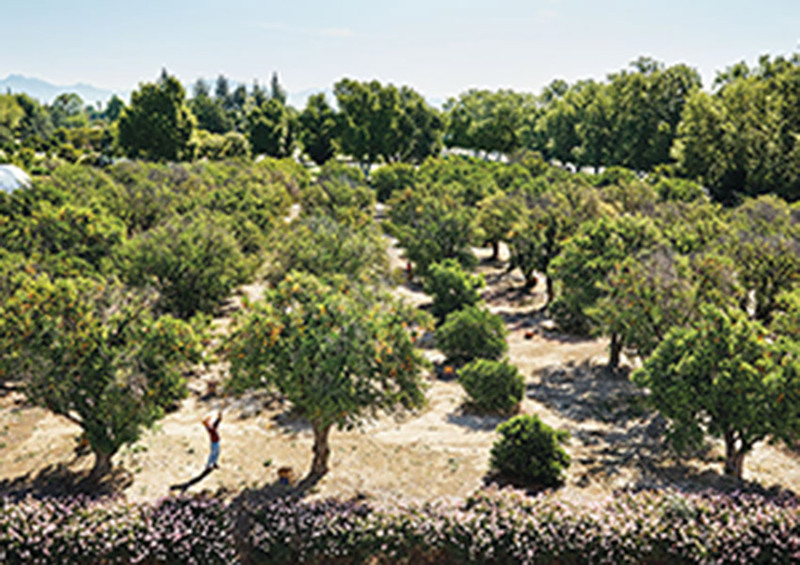 Every year on a Sunday in April, Food Forward picks these oranges, setting out boxes and driving trucks deep into the grove along the few paths. When I arrive there by 10 a.m., the groups have already been busy. There’s a large contingent of volunteers from Bank of America in red T-shirts and an equal number of men and women from an organization called Gay for Good climbing up trees, dividing themselves among those who want to be on ladders and those who want to haul boxes to consolidation points. Wearing shorts, sneakers, and a big smile, Rick is at the center of it all. “The Seabees will come by later,” he says, using the shorthand for members of the Naval Construction Force who are driving from the base at Port Hueneme for the evening’s last sweep. I have a notebook, but of course I’m soon hauling boxes. What the effort speaks to is a form of decency. We’re not the figures in the Millet painting picking our way through the stalks. We’re the gleaners of today, who apply a little zinc oxide to our noses before heading out, who arrange to leave the backyard open, store the trolley with the park manager, meet by the kettle corn stand, hear the satisfying pop of the Ball jar sealing, and when jolted from our daydreams, become part of a chain of people handing off boxes full of oranges to a truck, where they’re stacked and driven away. Patric Kuh has been the restaurant critic for Los Angeles since 2001. From the forthcoming book Finding the Flavors We Lost: From Bread to Bourbon, How Artisans Reclaimed American Food by Patric Kuh. Copyright ©2016 by Patric Kuh. To be published on June 21, 2016, by Ecco, an imprint of HarperCollins Publishers. Excerpted by permission. Next articleThese Might Be the Worst and Weirdest Street Names in the History of L.A.